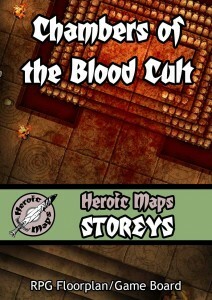 Heroic Maps released a new Chamber of the Blood Cult maps pack over in their webshop. Beneath the Arcane Bookseller's in Wardenhale lies a secret. A deadly secret. A series of increasingly dangerous and evil chambers dedicated to the God of Blood. Chambers of the Blood Cult is a printable dungeon floorplan compatible with any RPG/Dungeon-Crawl game. It can be used as a standalone gameboard, or combined with any same-scale tileset. Chambers of the Blood Cult is a multiple level set, comprising 8 10x12 square battlemaps. The top level is an inocuous bookseller shop, but each level below becomes more dedicated to the Blood Cult. Features include arcane circles, piles of skulls, sacrificial slabs, altars, statues and shrines, pools of blood and more. The Chambers of the Blood Cult set is perfect for Chaos adventures, or the lair of a Vampire.